Seymour Papert passed away this weekend. His ideas have helped us form the pedagogical approach behind Pedago and our first product, Smartly. Seymour Papert passed away this weekend, and I felt compelled to revisit his classic book, Mindstorms: Children, Computers, and Powerful Ideas, in tribute. Papert’s legacy far exceeds this one book, of course; he’s an inventor of the Logo programming language, and he was hugely influential in the fields of artificial intelligence, educational technology, and child development over the course of his half-century career. Closer to home, his ideas have helped us form the pedagogical approach behind Pedago and our first product, Smartly. Three years ago, my co-founder Ori Ratner and I read Mindstorms outside of his apartment complex in Arlington, VA as we formulated our opinions about what was missing in educational technology. In the early days of the company, we encouraged all new employees to read the book before starting, so that we could all have a shared vision for what was possible. While the book is nominally about children using computers to learn, it establishes a vision for how anyone—adult or child—can learn. Mindstorms was published in 1980, the same year as Carl Sagan’s Cosmos. Despite the possibility that, like an old science fiction novel, it might have aged past its usefulness, Papert’s prose is inspiring. Certain sections feel revolutionary. The future he had envisioned had still not come to pass, but reading it that summer, it felt just inches away. Rereading Mindstorms, I’m struck by how poetic the book is. Mindstorms is at times similarly poetic, merging Papert’s musings on his own learning experiences with a glimpse into what successful learning might look like in the future: “You can’t think seriously about thinking without thinking about thinking about something.” He relates a formative example from his young childhood, of imagining what it’s like to be a gear, and describes the impact of that very personal experience on his future learning and mental development. His goal in writing the book and creating Logo was to give more humans an experience of what that’s like. For me, the reminder of the personal side of learning is one of the most powerful aspects of the book. It’s not just about assimilating information, but about the learner constructing their understanding. Two Smartly developers mentioning Papert’s Logo as an early coding inspiration. Mindstorms: Children, Computers, and Powerful Ideas. New York: Basic Books, 1993. We’re excited to announce that Smartly’s groundbreaking free MBA program will open its doors to our first student cohort this week! From the moment MBA applications opened earlier this year, we were overwhelmed by the positive response. Of the thousands of students who applied, we were only able to accept 7% to our first class. We plan to accept students to additional cohorts later this year. Our students hail from top undergraduate and graduate schools, drawing from diverse backgrounds spanning engineering and finance to humanities and the performing arts. Many have careers in business-oriented fields like consulting and banking, while others are entrepreneurs, lawyers, and even veterinarians. We have roboticists from Tesla and Amazon (the company), the founder of a tea company that gives revenue back to indigenous farmers in the Amazon (the jungle), and even a student who has beaten cancer twice! The Smartly MBA is composed of 42 core courses equivalent to the subjects taught in a traditional MBA degree. Courses are organized into 9 concentrations, including Business Foundations, Accounting, Finance, Data & Decisions, Markets & Economies, Marketing & Pricing, Strategy & Innovation, Leadership & Management, and Supply Chain & Operations Management, with optional electives for further study. Students who finish the program will receive an MBA licensed through the Washington, DC Office of the State Superintendent of Education. When they graduate, students will be matched with employers around the US, opening up job opportunities that make use of their newly-minted skills. We’re passionate about expanding access to impactful education here at Smartly, and we believe that a free, high-quality MBA is an important step in this journey. Thanks to all of our learners who have supported and inspired us in this endeavor. We can’t wait to show you what’s next! For years, Chris was convinced that gaining an MBA from a top business school would lead to guaranteed success and happiness. In the end, he turned his acceptance down. For years, I was convinced that gaining an MBA from a top business school would lead to guaranteed success and happiness. After all, they take in ambitious, creative, entrepreneurial types and spit out brand new Masters of the Universe at the other end, all guaranteed to progress on to business success, right?! Cue the all too familiar gauntlet of GMAT tests, poring over school brochures and websites, campus visits, ‘meet-and-greets’, and the endless hours of application preparation and submission, each costing on average about $150. In total, I have easily spent in excess of $4,000 simply getting to the stage of hitting the ‘submit’ button on various applications. I am a small animal veterinarian and I’m at the stage in my career, and life, where I am acutely aware of the question, “Where am I going next?” Not completely enamoured of the usual, predictable and ‘safe’ options, and, to be perfectly honest, somewhat disillusioned with much of my current profession, I looked towards an MBA as being the answer. I have entrepreneurial ambitions, specifically within the tech sector, and so it seemed logical that formal business training, with the plethora of additional advantages that attending a top school offers, was exactly what was called for. I know for a fact that I would find the experience of spending 1-2 years in a major seat of learning and culture with equally ambitious sorts from all corners of the globe a wonderful one indeed. And so it was that my journey to business school began. Coming from a non-traditional ‘quantitative’ career such as veterinary medicine, I was keen to bolster my familiarity with the core MBA curriculum and came across the Smartly app. Instantly drawn into the simple, immersive, bite-sized, and beautifully presented lessons that had a fun, game-like feel I found myself a dedicated user, powering through all of the available lessons and eagerly awaiting any new material developed by the Pedago team. It was, therefore, an easy decision to put my hand in my pocket and pay for the service* when the full version went live. It was that good! I turned my acceptance down! The principle reason for this huge decision was simply the prohibitively inflated cost of studying for an MBA, with my projected expense easily looking to be in the region of $120,000 once the $90,000 of tuition was added to reasonable living expenses. Whilst it is no secret what the cost of an MBA is when students apply, such numbers seem unreal until such time that you are staring at a loan agreement. ROI uncertainty and the realities of staggering debt to pursue my dream aside, I had to really ask myself if there was another way to obtain the same level of top MBA knowledge without bankrupting myself. 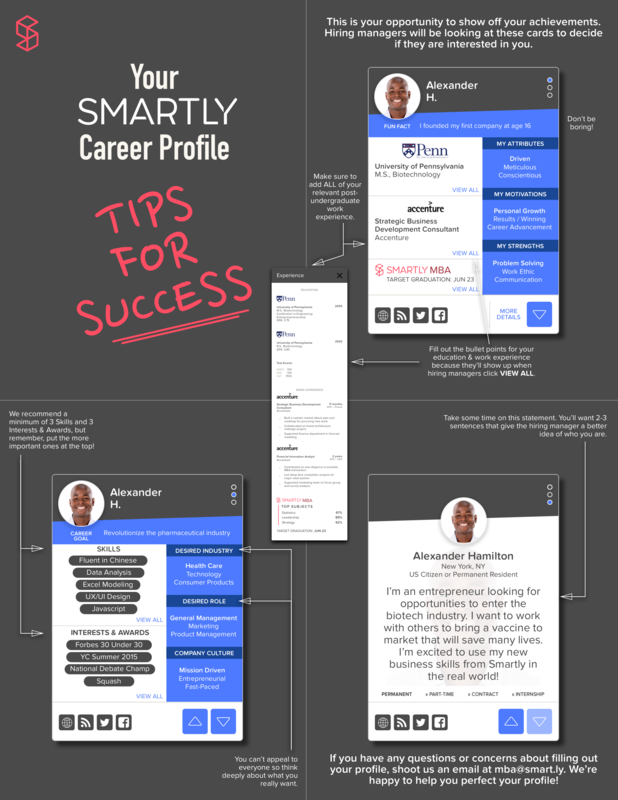 Smartly once again came onto the scene offering a full MBA degree, with its clear curriculum, simple and intuitive interface and impressive catalogue of ever-expanding content. Oh, and it’s significantly more attractive price tag! With my application submitted I now eagerly await their decision on whether I shall be one of those admitted to their new online MBA.